This year, my brother, Will, and I took different approaches to preparing for the 2009 Star Trek CCG World Championships. He spent the weekend before in Germany playing in the European Championships, while I spent the same weekend deciding which decks I should build and play in the World Championships. I'd had plenty of time to make this decision previously, but in a display of supreme laziness I had left it until the last minute. With Will arriving back from Germany very late on Monday, and us due to fly to the United States very early on Wednesday, I didn't have a lot of time to test my deck choices. Will had already played a lot of games over the weekend and was looking forward to a day or two of rest between championships, so I had to resort to begging to get him to help me test my decks. 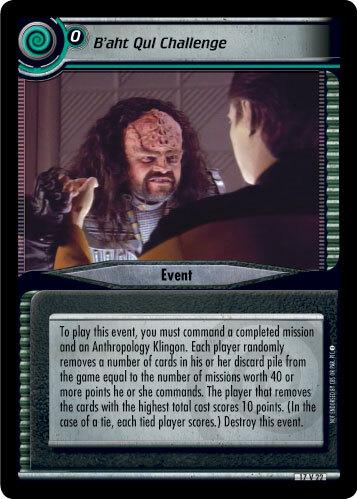 My original choice for a day one deck was a Klingon Sword of Kahless solver, with one use of All-Out War to slow my opponent down. It turned out that only killing three personnel a game was not very satisfying, so I added more battle to the deck to quench my blood-lust. 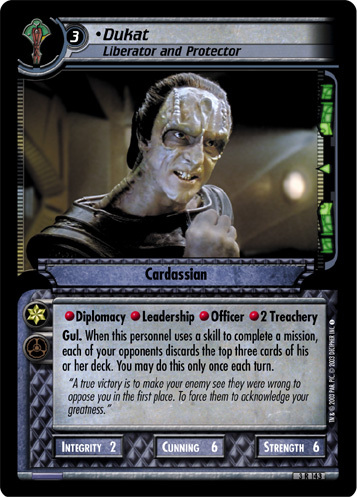 My choice for a day two deck was a Cardassian capture deck that was designed to capture as many personnel as possible before struggling through two missions near the end of the game. I knew the deck was going to play slowly, so I thought that day two's format of a best of three match-up - where timed wins don't matter - was a good opportunity to try it out. With my decks somewhat tested, all that remained to do was to get some rest before we departed for the airport to begin our trip. Unfortunately, the testing had gone on for so long that we only had about three hours of sleep before our alarms went off the next morning. This wasn't a good start to the trip. Things didn't look much better once we boarded the plane for the flight from London to Chicago. Will and I usually look forward to the transatlantic flight because we get the chance to watch several movies on the in-flight entertainment system. Unfortunately, there was only one movie that I was interested in watching - the new Star Trek movie - so I spent the entire eight hour trip watching it over and over again. I also managed to spill food down my front on three different occasions during the flight. I'm blaming the turbulence, even though no other passengers seemed to suffer from the same problem. Having arrived at Chicago, we spent some time queuing to pass through various security checkpoints. It was at the front of one of these queues that this year's rubber glove story happened. Will was having his boarding pass and passport checked, when the TSA officer realised she wasn't wearing any rubber gloves. She apologised for the delay while she put them on, saying she would get into trouble if her supervisor noticed that she wasn't wearing them. She then waved Will through, and while inspecting my documents, she looked straight at me and said "at least I wasn't putting on elbow length rubber gloves." My reaction could be described as nervous laughter. Later on, while still in the airport, we heard a recorded announcement that explained the TSA officer's comment to me. The announcement stated that the current threat level was orange. I had no idea if this was generally good or bad, but I was wearing a food-stained orange T-shirt at the time and assumed that I had either been picked out for my fashion sense, or my inability to put food in my mouth - or some combination of the two. Having eventually made it to Indianapolis, funny things stopped happening, so I'd better move onto the tournament reports. Before I begin, I'd like to apologise if my recollection of the games isn't totally accurate. I do live in my own little world, and sometimes my memory of what I think happened differs from what actually happened. The first tournament Will and I played in was an Orbital Shift tournament. You start off by playing your own deck, but after fifteen minutes everyone moves one seat to the left and continues the game they are now sitting at. It can get very confusing, but it is a lot of fun and is the ideal way to start a tournament weekend. Having already established how lazy I am, it should come as no surprise that the Dominion deck I played at last year's World Championships was still sitting in my deck box. I thought it would be perfect for this format, as it is easy to play; and I didn't want to expose either of my other two decks at that time. My first opponent was someone called Will Hoskin. We both gave Charlie the evil eye for pairing us together in our first game before embarking on the fastest game we have ever played together. I had an almost perfect draw, while Will had an almost equally bad draw. The game was so fast that I was able to complete three missions and win before the first fifteen-minute shift was called. After that, things get a little hazy, but here are some highlights I do remember: Attempting a mission with ten personnel and having eight of them killed by a Tragic Turn dilemma pile; Having a ship destroyed by a Quantum Filament, Entanglement, Nanite Attack, Gomtuu Shock Wave combination; and locking a Borg deck out of its planet missions with Strange New Worlds and Biogenic Weapon, before having to shift around the end of the table into playing the deck I knew couldn't win. In the end, I'm not entirely sure how the tournament was scored, but either I or my deck finished third out of nine players. You can see the final tournament standings here. The second tournament of the day was a This Side of Paradise pre-release. Each player was given one starter deck, three real boosters and one virtual booster of cards from the new expansion. I received the Borg starter deck, and was able to draft two additional copies of the Computation Drone and an additional ship from the three real boosters. 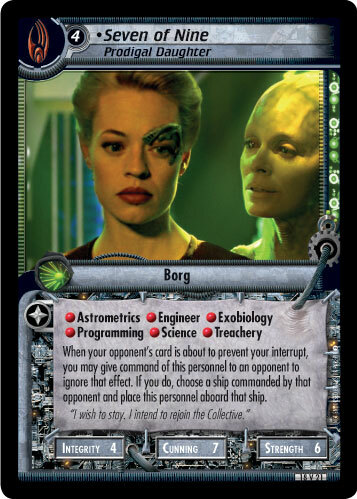 My This Side of Paradise virtual booster contained Seven of Nine (Prodigal Daughter) to compliment the Seven of Nine (Representative of the Hive) already in the starter deck, but no other cards - even dilemmas - that I could use. At the back of the pack was an unexpected surprise - a foil Old Feelings. It looked amazing, but wasn't really much use to me in a sealed deck tournament. In the back of my mind, I knew there was some weakness in the Borg starter deck, but I didn't put my finger on what it was until I played John Corbett in the first round. My first attempt with ten drones resulted in two of them being captured by Restricted Area, before the rest were stopped by Tense Negotiations. On my subsequent turns, John was able to stop me again and again with Tense Negotiations because I had yet to play the Borg Queen. When I finally did play her, John played Command Decisions followed by Don't Let It End This Way to kill her on her first mission attempt. Even though John was playing Klingons, and he was attempting cunning-based missions, I lost the game heavily. My second game was against Amber Mitchell, playing Romulan. She played Arandis (Risan Facilitator) on her first turn, so without a thought I downloaded the Borg Queen, and never looked back. I interlinked a skill each turn, and was never short of one for the rest of the game. My particular favourite was interlinking Security shortly before Amber drew and played Ornaran Threat - that was inspired! Having won that game, my third was against Ben Johnson. Ben was also playing Romulan, and unfortunately for him, I drew my Borg Queen on the second turn. I tried a different tactic in this game, and just interlinked my least numerous mission skill before making an attempt. This worked quite well, and Ben was unable to completely stop any of my mission attempts. After three rounds, my two wins and one loss left me in seventh place out of 18 players. You can see the final tournament standings here. Deck: Nick was playing a Klingon two mission win deck using B'aht Qul Challenge for the additional points he needed to win. His decklist has not yet been posted online. Game Summary: This game got off to a good start for me. We both spent the first few turns building up personnel. Nick was using Mara (Science Officer) as a download engine, while I was simply playing the personnel I drew. Any time Nick played an event, especially Warrior's Birthright on Honor the Fallen, I was able to destroy it with Korath (Duplicitous Tinkerer) by playing an equipment. So far, so good. Unfortunately, the game then took a downward turn for me, as I struggled to draw into a ship. Nick was off attempting Honor the Fallen, where I was able to stop him for three turns with my dilemmas, but I still had no ship. When I eventually did play one, Nick stopped it with ease (see the moment to forget, below.) On the next turn, Nick completed his space mission and used the mission ability to restore the range to all of his ships. That allowed him to return home, switch ships and then fly to attempt Deliver Ancient Artifact. I was able to kill three personnel with my dilemmas, but that didn't stop Nick's stupidly high strength Klingons from completing the mission. At this point I realised why Nick had been using Dukat (Pah-Wraith Puppet) to remove the high cost cards from my discard pile: B'aht Qul Challenge. I didn't think it made much sense to kill his personnel at this point, so I decided to try and complete a couple of missions instead. I was able to complete Protect the Escapees for 30 points, but that was the best I could manage. On the final turn, I used Grav-Plating Trap to prevent one copy of B'aht Qul Challenge, but Nick already had a second copy in hand and simply used Mara to download his third copy. Thanks to Dukat, I only had three cards in my discard pile by this time, so Nick easily scored the 20 points he needed to win the game. Moment to Remember/Forget: Having finally played a ship, I flew to attempt Protect the Escapees - a mission requiring Treachery. I only had one personnel on board my ship with Treachery, but I wasn't worried because I knew that I could use William T. Riker (Exchange Officer) to copy any skill I needed. What I forgot was that he only keeps the skill until the end of the mission attempt, and not until the end of time. Nick played Secret Identity against me, so I copied the Treachery from Chang (Gorkon's Chief of Staff), before Nick picked Chang to be removed. I could have simply replaced him with another Treachery personnel, but I didn't. I remember thinking that "Riker has Treachery so I don't need another." Sure enough, Nick stops my attempt with the next dilemma, and my ship is now sitting there with no Treachery personnel on board. To make matters worse, the ship didn't have the Range to fly to Qo'noS and back in one turn, so the best I could do was to score 10 points from an engagement using BaH!. Facepalm moment #1. Tournament Standing: 0 wins, 1 loss. Deck: Braxton was playing a Cardasssian capture deck using Labor Camp to score enough points for a two mission win. You can read his decklist here. 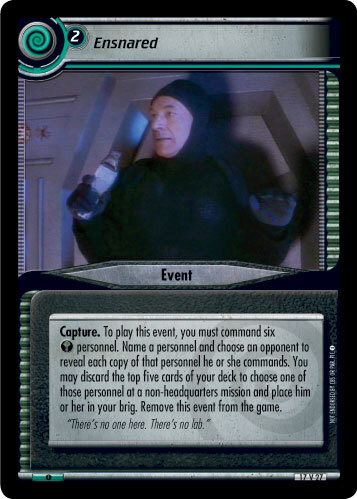 Game Summary: Part of my reason for deciding to play Cardassian Capture on day two (should I make it) was because I looked through many decklists and noticed that few players can actually rescue captives from the brig. I didn't expect to face a capture deck on day one, and was totally unprepared for it. The full-on capture experience didn't happen though, because it turned out that this was Braxton's first tournament and he didn't have all the cards he needed for his deck. He did have Ensnared and Labor Camp though, and that was almost enough for him to win the game with. I began the game by completing Protect the Escapees on my second attempt, before losing a captive to Ensnared. Braxton wanted to capture Kruge (Instinctive Commander) but couldn't remember his name, so he settled for someone else. He then remembered Kruge's name and played a second copy of Ensnared to take him as well. That gave him confidence to leave his headquarters and he flew to attempt Kressari Rendezvous. It was at this point that my dilemma pile failed me. When I draw nine dilemmas, I should on average draw two planet, two space and five dual dilemmas from my pile. What I did draw was five planet dilemmas, two copies of Skeleton Crew, and two dilemmas that could actually have an effect on the current attempt. I played them both, but that wasn't enough to prevent Braxton from completing the mission. He then moved to his planet mission, where my dilemma pile was slightly kinder to me. I was able to kill a couple of personnel with Unfair Terms before stopping the attempt. I felt the blood-lust return on my next turn and ferociously raged All-Out War to kill four of his remaining personnel. That left him stranded, so I did the only decent thing I could do on my next turn: I killed three more personnel with a second copy of All-Out War. This would leave me five points short of my required victory total, so the following turn was spent drawing for a BaH! (to score ten points for winning an engagement), before I attempted Secure Strategic Base. Braxton was able to take another captive and stop my attempt in the process. He then flew over to take a fourth captive using Odo (Impartial Investigator), before returning to his planet mission for an attempt. As a consequence of a Braxton's relatively small draw deck, him using two copies of Ensnared and me killing a lot of personnel, he had decked himself by this point. When he attempted, I played Uninvited for a Secret Identity and proceeded to remove one particular mission skill from his remaining personnel. On my turn, I left five personnel and The Sword of Kahless at Brute Force (where they were subsequently stopped by dilemmas), while the rest of my personnel began an engagement using BaH! for the ten points I still needed. Braxton then retaliated on the following turn by playing Standard Cardassian Procedure, and attacking my ship to take a fifth captive from me. It turned out to be one of the two command icon personnel I needed to staff the D-7 Battlecruiser, so I too was stranded. Fortunately, I could still complete Brute Force with the five personnel I had left there, and they were able to do so after Braxton was unable to play any dilemmas against them. Moment to Remember/Forget: Braxton's deck had no trouble taking a captive or two. He just didn't have many good punishment events to make the opponent pay. I'm happy to say that after the tournament I traded him a handful of cards to help his deck, so it should be much more effective. Future opponents: you have been warned! Tournament Standing: 1 win, 1 loss. 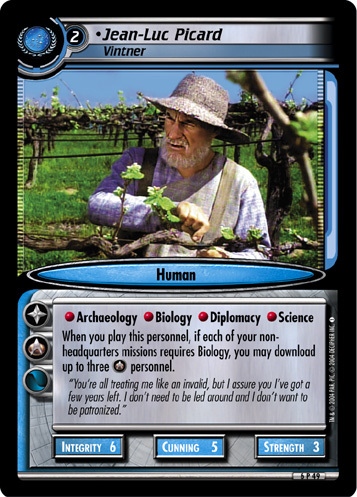 Deck: Al was playing a Next Generation Federation Vintner two-mission win deck. His decklist has not yet been posted online. Game Summary: Al started this game very quickly with a first turn Jean-Luc Picard (Vintner) to download Leonard H. McCoy (Remarkable Man) and two other personnel. I was slightly worried by the sight of McCoy, as my dilemma pile wasn't working too well, and I knew that he would enable Al to complete his first mission with minimal personnel. Despite this worry, Al spent several turns building up more personnel, and I was the first to make a mission attempt. It was easily stopped though, as was Al's first mission attempt and my second attempt the following turn. By killing two personnel, I thought I had done enough to stop Al's second attempt at Traverse Ion Storm, but McCoy came to the rescue and the mission was completed. With an additional 10 points scored from the U.S.S. Enterprise-D (Federation Flagship), Al was already half way to the victory after one mission. He then flew to Aid Lost Colony where I was able to stop him with my dilemmas. The blood-lust then made an appearance and, after I auto-completed Protect the Escapees, I used Drex (Arrogant Warrior) and All-Out War to kill four of his personnel on the planet. Unfortunately, one of those four turned out to be Jean-Luc Picard (Vintner), so Al got to play another copy on his next turn and download three more personnel. I would have liked to use Kruge (Instinctive Commander) at this point, but I had not yet drawn a Point Blank Strike with which I could use him. Instead, I played another copy of All-Out War and killed three more personnel. While Al then rebuilt his personnel, I worked my way through several mission attempts at Secure Strategic Base. Shortly before I completed it, I finally drew into a Point Blank Strike, so I used Kruge to commandeer the U.S.S. Enterprise-D (Federation Flagship). On the following turn, Al played both Guinan (Listener) and Tallera (Covert Isolationist). The five points from Guinan put him at a total of 55, and I knew that Tallera would provide the extra five points he would need for a two mission win. I was fortunate enough to stop his next mission attempt, before using my five points from Guinan on my third copy of All-Out War. The three deaths (not including Tallera) gave me time to begin my mission attempts at Brute Force, while Al was forced to play even more personnel. At his next mission attempt, I noticed his draw deck was rather small so I played an Uninvited for a Secret Identity. Tallera was in the team, and I picked her. Al couldn't replace her with another Non-Aligned personnel and the attempt failed. On my turn I made my final play at Brute Force. I had about twelve personnel, as well as The Sword of Kahless, so formed multiple teams who could complete the mission. The first team of four was my main team, but I hoped that Al would think it was a bluff. He chose not to play any dilemmas, and I completed the mission for the win. Moment to Remember/Forget: At one point, I needed to score ten points from BaH! because I had already used some of those points with All-Out War. My I.K.S. Rotarran (Ship of Tears) flew over to Aid Lost Colony to begin an engagement against an empty U.S.S. Pasteur (Medical Ship). As soon as I announced the engagement, I began counting the Honor Klingons aboard the ship, and realised I didn't have any. My battle hardened Klingons couldn't beat an empty medical ship. Facepalm moment #2. Tournament Standing: 2 wins, 1 loss. 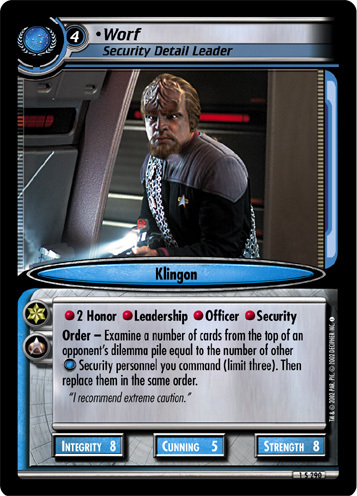 Deck: Mike was playing a Next Generation Federation Kirk deck using Worf (Security Detail Leader) to look at up to four dilemmas from the top of my dilemma pile whenever he wanted. His decklist has not yet been posted online. Game Summary: Mike began this tournament with two earned byes for his performance at the 2009 North American continental championships. He then beat Will in round three before this match up in round four. Is two byes and two Hoskins a good way to start a tournament? It was for Mike, as this game was over in less than fifteen minutes, thanks to my memory and my dilemma pile. Mike's deck was fast, and I knew that I would probably have had to give him a mission or two before I could wage war on his personnel. Unfortunately, at Investigate Maquis Activity, I totally forgot Mike had played Leonard H. McCoy (Remarkable Man). I drew both Aftereffects and Unfair Terms, but I only played one of them thinking that it would be enough against his team of weenies. It wasn't and he completed the mission. He then moved to Transport Delegations before checking the top dilemma with Worf. Necessary Execution might have caused him problems, so he attempted with one to remove it before beginning his main attempt with five personnel. Mot (The Barber) was part of the team, so I got to draw four dilemmas. The three space dilemmas and Skeleton Crew that I drew meant that Mike completed the mission without facing a dilemma. While still cursing at my dilemma pile, I decide I need to make a move on my turn. I attempted with seven personnel at Protect the Escapees and ran into Hard Time followed by Where No One Has Gone Before. That resulted in no overcome dilemmas, and all my personnel taking at trip to the edge of the universe. On Mike's next turn, he used Worf again before attempting his space mission. I didn't think my dilemma pile could get any worse, but it did. The only dilemma I drew that I could use was Secret Identity. I used it to remove James T. Kirk (Original Thinker), but Mike still had half his deck to choose from, and it made no difference. Game Over. Moment to Remember/Forget: Umm, the whole game. Tournament Standing: 2 wins, 2 losses. Deck: Josh was playing a Terok Nor weenie deck. You can read his decklist here. Game Summary: I had no idea what to expect when I saw Josh's missions. I did have more of an idea after his first turn though: Weenie Jem'Hadar, and cheap high-attribute personnel like Persis (Loyal Daughter) and Odo (Wayward Link). My opening hand was filled with battle cards, so I decided to play them over the first few turns instead letting them clog up my hand. Unfortunately, Josh had played the two one-cost Jem'Hadar, Odera'Klen and Rak'tazan, by this point, and they were both sacrificed with Our Death is Glory To the Founders to prevent me from playing two copies of Point Blank Strike. Despite this small setback to his personnel count, Josh was out attempting his missions way before I was ready, and completed Kressari Rendezvous quickly. After that I had more success with my dilemmas, and was able to kill off a number of weenies. Meanwhile, I began my own mission attempts and discovered an annoying quality of Josh's initial dilemma selections: he was able to stop two attempts without leaving a single overcome dilemma beneath the mission. My small team of Klingons had to face multiple copies of Hard Time, as well as The Dal'Rok and Where No One Has Gone Before. Fortunately, once I had faced them, Josh began using "regular" dilemmas that did get overcome, and I was eventually able to complete two missions. My dilemmas had built up underneath Survey New World by this point, and I was forced to use an Uninvited to get Full Complement in order to stop a team of four personnel from completing the mission. I don't know whether I had removed mission skills, or whether Josh was worried about losing his ship to Kruge (Instinctive Commander), but he declined to make a second attempt, despite having what looked like enough personnel remaining to do so. That decision was enough for me to win the game within two turns. Despite Josh completing Survey New World on his next turn, I was able to make multiple attempts - thanks to The Sword of Kahless - and completed Brute Force for the win. 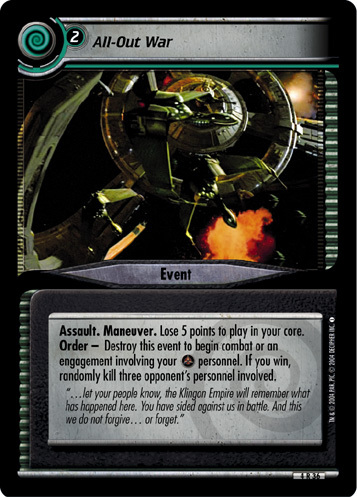 Moment to Remember/Forget: When Josh completed Kressari Rendezvous, he used the ability on Dukat (Liberator and Protector) to make me discard the top three cards of my deck. Two of those three cards were Kruge. What are the odds? I mean, WHAT ARE THE ODDS? I calculate it to be something like 1 in 400! Tournament Standing: 3 wins, 2 losses. This concludes the first part of this report. Will James Hoskin will qualify for day two? Can his virtually untested deck, and his shockingly poor dilemma pile hold out for a few more rounds? Find out in part two. Have an opinion about this tournament report? Post it here, or contact the author!